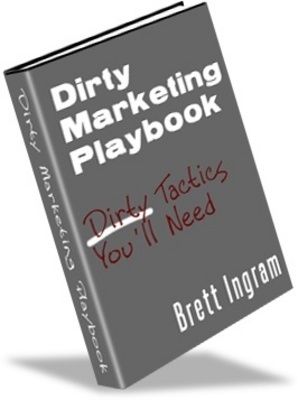 Dirty Marketing Playbook -Make More Money From Your Website! I’ve seen books that don’t contain half of the information I’m going to give you sell in the stores for thirty, forty, even fifty dollars. Thinking about everyone that’s sunk their hard-earned marketing dollars into these “quick fixes” is enough to make me want to scream. If they only knew how much value they weren’t getting for their dollar! I firmly believe that everyone should have access to this information, which is why I’m offering my e-book at a bargain price-with a money back guarantee to boot! 100% Love It or Leave It 90 Day Money-Back Guarantee! If youre not totally thrilled with “Dirty Marketing Playbook - Dirty Tactics Youll Need” for whatever reason at all, simply send me an email and Ill cheerfully refund 100% your money with the click of a button. Dirty Marketing Playbook -Make More Money From Your Website! dirty marketing;make money from your website;make more money 143003226 21.97 counhav Fresh Download Available!